Some years ago, in daydream ruminations, I began developing a theory about what makes Vintage so compelling, as distinguished from other Magic formats. How can something as intangible and unquantifiable as “fun” be described? Intrigued, I began to formulate a mental catalogue of answers. First, Vintage features high impact, high stakes plays. A minor miscue in a high speed race can result in a severe crash; the same is true of Vintage. Fetching a land at the wrong time can result in Ancestral Recall – or worse – resolving. Given the objectively high power level of the tactics in the format, there is a natural anxiety – and exhilaration – produced from playing the format. Anything and everything can and will happen, and as early as the first turn. There is no passive early game, where nerves are calm and game play sedate. Vintage is high octane. It’s a thrill, and there is a rush. Vintage is a format of unusual complexity. The combined quantity of lines of possible plays and the depth of those lines is probably a signature feature of the Vintage format. 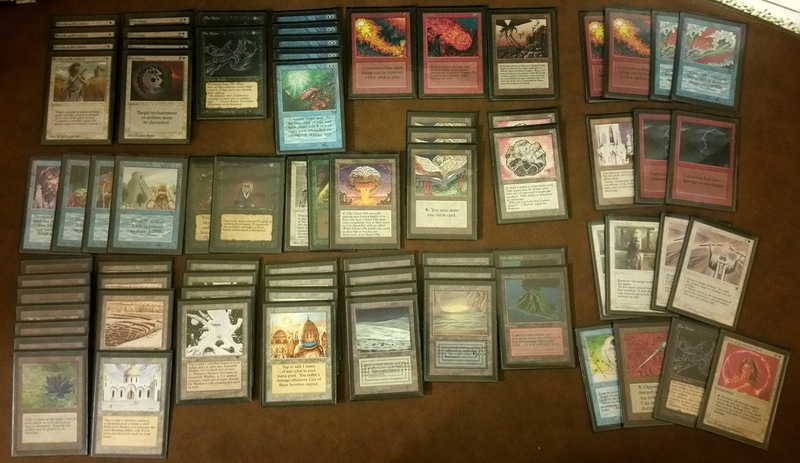 I doubt there is any other format where planning a Doomsday stack can lead to as many permutations gamed out with as many unique variables as Vintage. 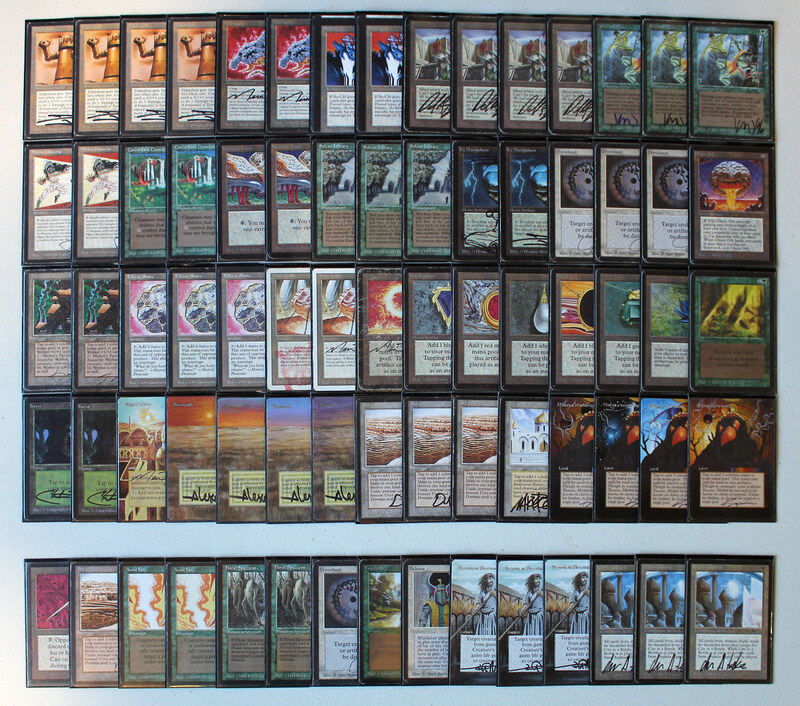 Legacy can nearly match Vintage in some respects, but the presence of restricted cards creates more unique lines, with twists and turns. In the heyday of Grim Long, I used to puzzle over lines involving multiple tutors, such as a Vampiric Tutor and Demonic Tutor, and enjoy wondering whether to fetch Black Lotus and Yawgmoth’s Will, or Mind’s Desire and Ancestral Recall, or some other set of possible strategic objectives. Similarly, you could spend days thinking through Gifts Ungiven scenarios, puzzling through combinations of cards that might win the game or merely allow you to live another day. Both the quantity of starting options, and the depth of possible links in the chain within each sequence, is probably a unique feature of Vintage. Third, Vintage’s large and unique card pool offers tremendous possibilities, almost dazzlingly so. While there are many examples of how the large card pool leads to intriguing or unexpected results, one that readily springs to mind was from 2007. At one of the marquee Vintage events of the year, the so-called “Waterbury,” there were separate Day 1 and Day 2 tournaments. Rich Shay lost in the finals of the first day tournament to Justin Timoney, who was playing Hulk Flash, a brutal combo deck that wins the game by casting Flash, dropping Protean Hulk to find 4 Virulent Sliver and a Heart Sliver to give them haste. Having suffered two Turn 1 losses to this monstrosity, Rich returned the next day with not only 4 Leyline of the Void to stop the Hulk combo, but also a pair of Leyline of Singularity to disrupt the Sliver kill. It worked, and this time, Rich beat Flash, and won the Day 2 tournament. In what other format, but Vintage, with an enormous card pool, can a smart player find a cool, but obscure tactic like that? Acknowledging that these features are unique or special to the Vintage format, however, does not fully answer the question I posed: assuming that they are part of the explanation, what is it that makes them so fun or intriguing? This question, too, I have taken more than a passing interest in over the years. And I believe I have arrived at an answer. It turns out that human beings are intrigued by matters that we are able to grapple with, but never fully understand or grasp. Some have observed that what makes the Mona Lisa such an intriguing and iconic piece of art is the ambiguity in her expression. Forgetting where I read this, but one author describes this quality as “bottomless,” meaning that the mind endlessly puzzles over the meaning and intent. If she had been clearly smiling, the image may not hold our interest long. In the gaming context, I have argued before, and will reiterate here, that what makes something compelling is it’s “replay value.” Games that are defeated easily or conquered, but far less interesting to defeat again, hold little replay value. Replayability derives either from the enormous effort needed to defeat it (in which case, once it has been defeated, it is no longer enjoyable to replay) or, better yet, from the fact that each repeat of the game is unique in some way. Although almost every well-designed deck in Magic has a clear game plan; even the most linear decks are interesting because of the range of circumstances and opposition they encounter, and how those games result in memorable and intellectually challenging circumstances. For example, although Dredge has a fairly linear game plan, the options for sideboarding and the variety of counter-tactics that the Dredge pilot must confront and overcome keep games interesting. Another way of understanding replayability is the concept of “meaningful choice.” All players want meaningful choices along multiple dimensions: we want meaningful in-game decision making, meaningful deck selection options, meaningful choices of color combinations, meaningful mulligan and sideboard decisions, and so on. “Meaningful” means both that such choices make a differences or shape the outcome of the game at least some of the time, and that they are not Hobson’s choices, but genuine options among different possibilities. Now, having tried to provide some insight into what makes games or any endeavor intriguing and fun, reconsider those unique features of the Vintage format I identified above through that matrix: each of those elements make Vintage more replayable, and enhance meaningful choice. A Restricted List, as compared to a Banned List, creates more lines of play and more options, since there are both more unique cards in decklists of formats with restricted lists, but also more unique links in the chain of sequences. When you add the high stakes and high intensity layer, then Vintage becomes the epitome of ‘cardboard crack.’ Little wonder you can find Brian Kelly battling Vintage on Magic Online at odd hours of the night. What does this have to do with Old School? Old School is a set of formats that feature or permit older sets, and generally exclude some number of new sets. The most popular version of Old School is known widely as “93/94,” and tends to permit only sets up to or including Fallen Empires (if that). By elucidating what makes Vintage so intriguing, I’d like tocompare Old School to Vintage, which is often just the most modern iteration of many Old School environments. Old School formats lack Vintage’s large card pool, and has less high intensity game play, since most specific plays in Old School are less high stakes, either in terms of risk or danger. But there are trade-offs. 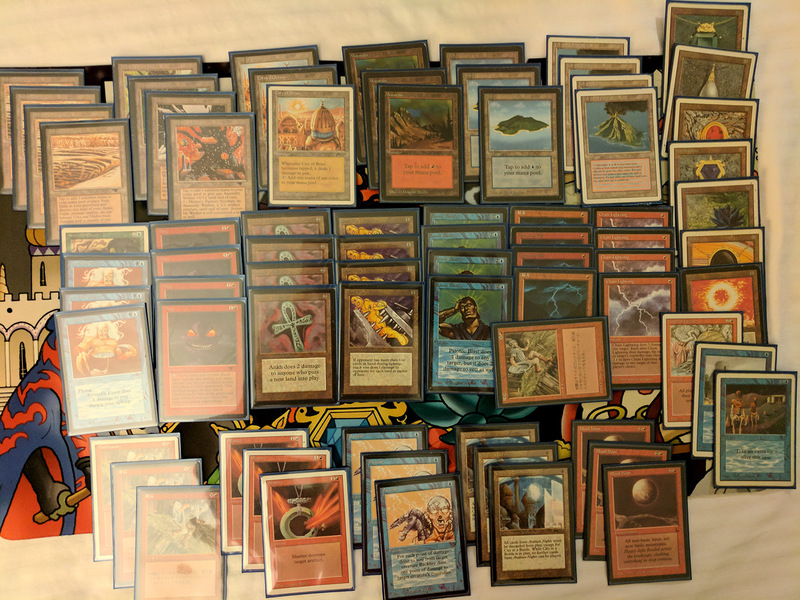 The main advantages that Old School has over Vintage are that Old School, pound for pound, is far more aesthetically pleasing to play. The flavor, artistic appeal, and iconic quality of the Old School is unrivaled. And, although there is no danger of getting Flashed out on Turn 1 in Old School, there is a thrill of facing a Turn 1 Juzam or playing Timetwister and hoping to draw better than your opponent. Some Old School environments, like those with Ice Age, are genuinely diverse and strategically interesting as well. I first encountered Magic when I was in middle school in 1993, and quickly became a Type I player, eventually giving up Magic – in disgust and dismay – when Type I was fully phased out of tournament Magic by late 1996 (returning only when encountering Type 1 communities on the Internet in 2000). Old School gives me an opportunity to relive and enjoy the format I adored so much as a teenager. 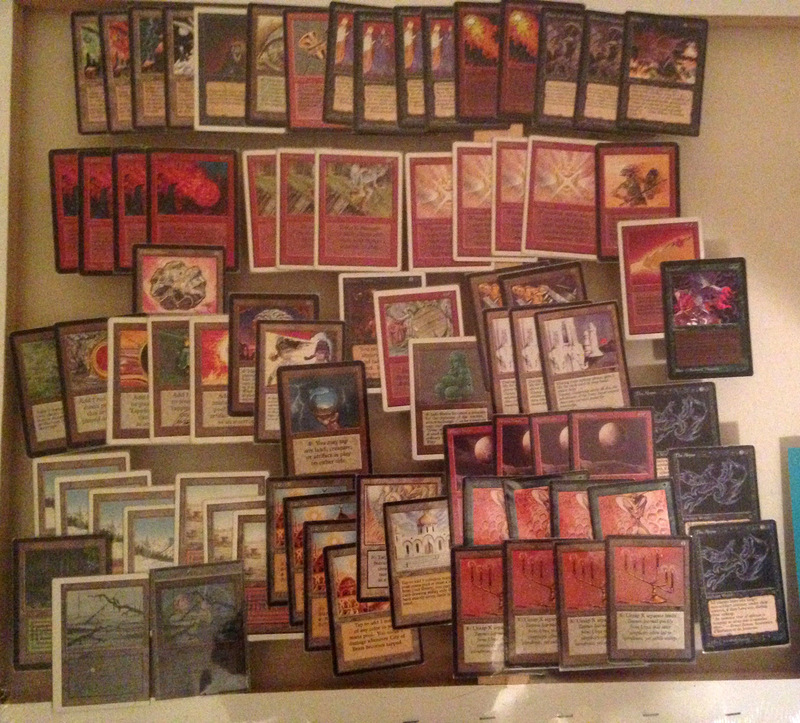 That’s why, in 2014, I picked up Old School with enthusiasm, and organized a local event, and began brewing new decks. The result of my efforts are a twelve-part series you can read here, on VintageMagic.com. 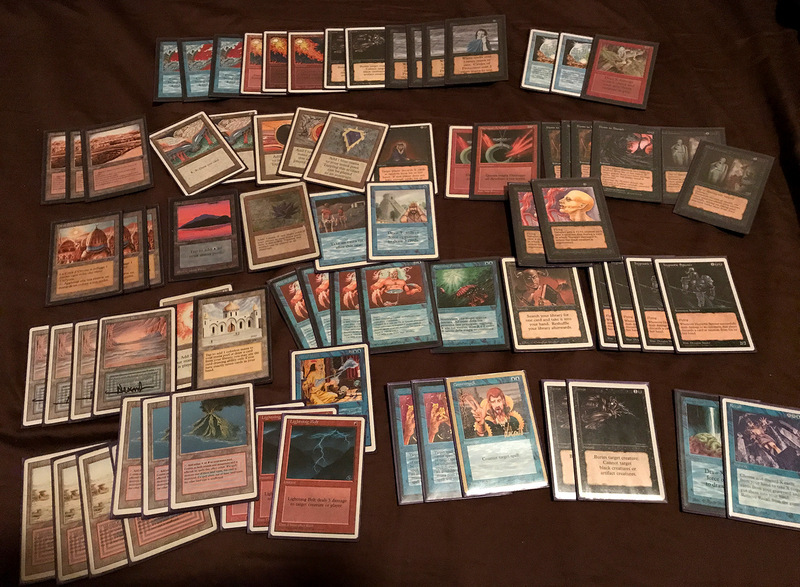 Old School Magic is a set of formats I enjoy exploring and brewing, and I have had many rewarding projects, from Transmute Prison decks to Forgotten Lore Combo decks to Reanimator Deep Spawn decks. The enjoyment I got out of brewing and playing Old School was not quite as fully flowered for the Eternal Central format because of the centrality of Strip Mine to that format. 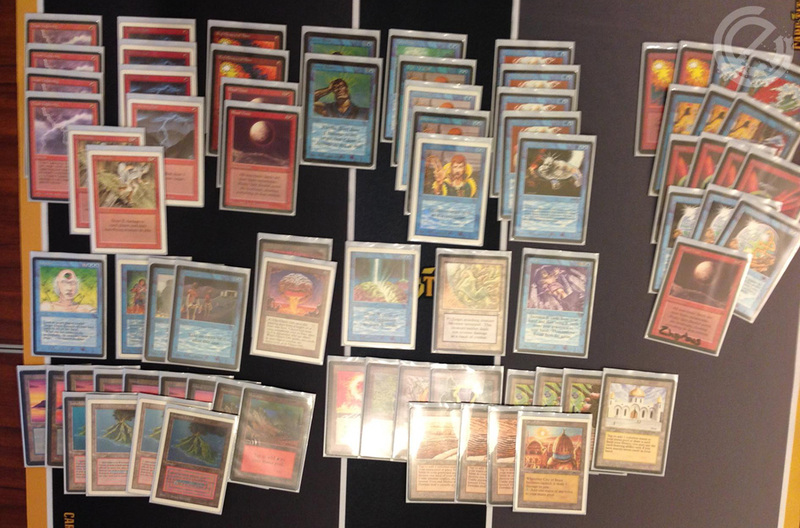 Unrestricted Strip Mine is the most dominant tactic in the Eternal Central metagame. 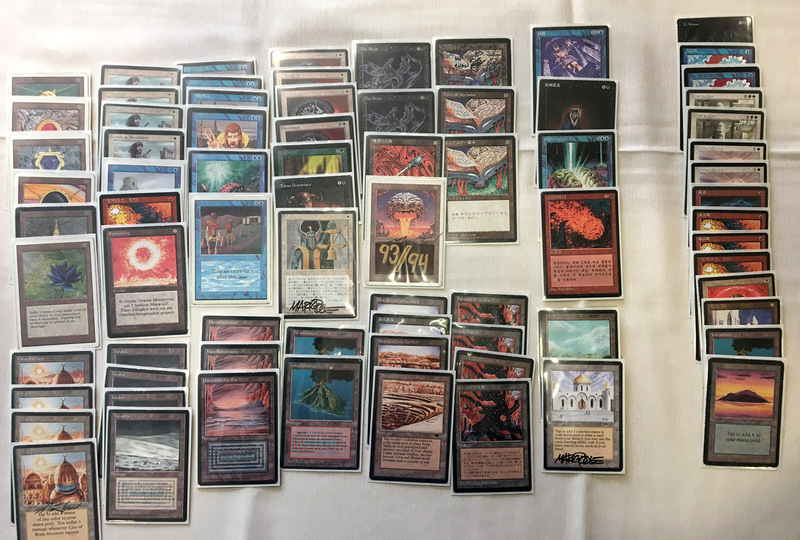 There were 31 out of 32 possible Strip Mines in the Old School Player’s Ball Top 8. 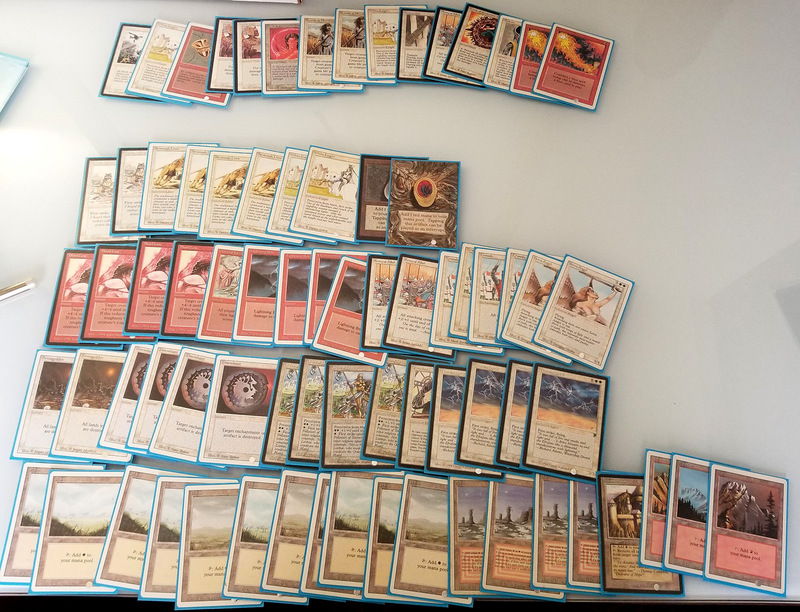 It had become clear, in fairly short order, as I was preparing for my first Eternal Central Old School event at Eternal Weekend in 2015, that the fulcrum of the format was Strip Mine. The top performing decks in my testing were entirely tempo or aggro decks, or otherwise decks with abnormally large mana bases like The Deck. Unrestricted Strip Mine marginalizes Combo and Prison strategies in particular, as the tempo decks are simply too consistent and reliable, and the Prison decks do not wish to – and do not profitably – trade one-for-one. Instead, they want to use cards like Stasis, Winter Orb, and Tabernacle, which are all disrupted by Strip Mine. Blue Red Control is already a very attractive strategy. You get access to up to all 8 Elemental Blasts, countermagic, and Blood Moon, one of the best tactics against The Deck. You also get Delver of Secrets analog Serendib Efreet, one of the most efficient quick threats in the format. 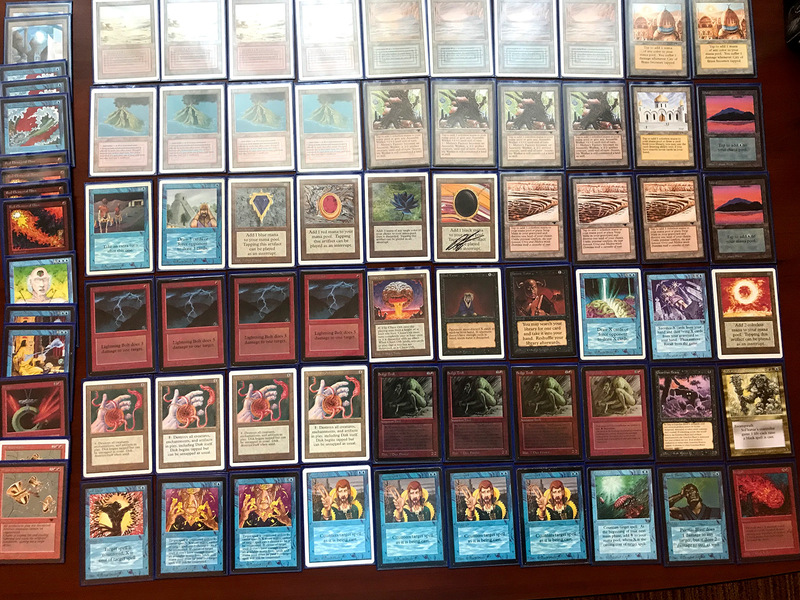 I would be tempted to play Blue Red Control in a regular Old School environment, but in an environment with unrestricted Strip Mine, it is irresistible. 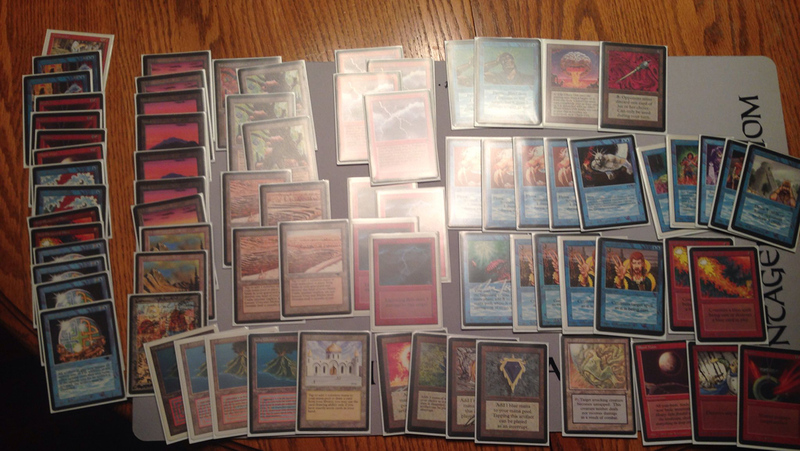 Testing and tournament experience before and in the years since has left no doubt in my mind that Blue Red Control is one of the best, if not the very best, strategy in any format with unrestricted Strip Mine, but is simply a very good deck in any environment with Strip Mine restricted. Unrestricted Strip Mine ratchets the tempo elements and possible mana screw component up to a maximum level. Moreover, Strip Mine environments compel mana base homogeneity to a much greater degree, such that no deck can afford to bend their curve down for virtual card advantage, while every other deck, even those employing Strip Mine, must increase the density and ratio of mana to spells. This doubly redounds to the benefit of decks like this, since it means that, pound for pound, it draws more spells over the course of the game, without actually having to bend the mana curve down at all. Unrestricted Strip Mine multiplies and compounds the unfairness. I also discovered that this strategy – UR Control – is probably the single best strategy you can play against White Weenie or W/U/x decks, which are usually the best performing inexpensive option you can play under Eternal Central rules. It’s unfortunate that I never got a chance to play Daniel Humphreys in 2016, as I feel my deck would have readily defeated his. Here was my video “Deck Tech,” if you want to get a quick sense of the strategy. 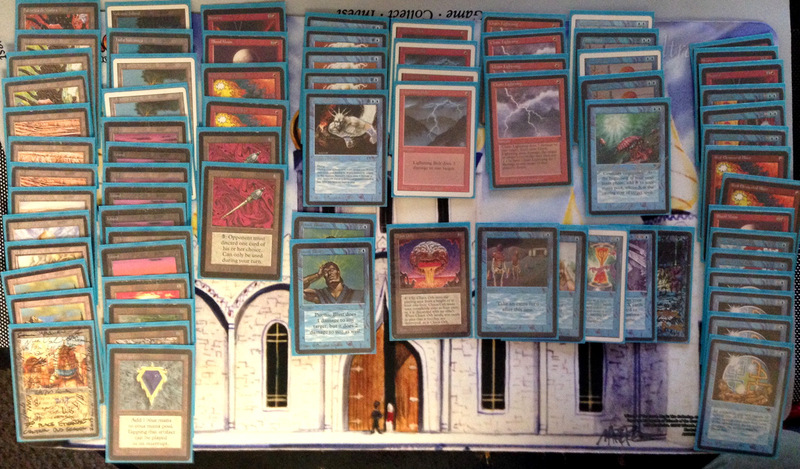 Going into the 2015 Eternal Central Old School event, I was perhaps overly concerned about White Weenie and other Weenie decks in the Strip Mine field, and ran a pair of Earthquakes main deck, on top of my 10 burn spells (Chain Lightning, Lightning Bolt, and Psionic Blast). Trying to maximize my spell to mana ratio, I also – foolishly – only ran 3 Factories and 3 Strip Mine. And, I had a second Blood Moon main deck, largely for The Deck. I also split my main deck discard package between 1 Disrupting Scepter and 1 Amnesia. In my Top 4 match against Randy in that event, I was a hair away from being able to cast Amnesia on Turn 1 in a decisive Game 3, and it was stuck in my hand for the rest of the relevant part of the game. Going in to 2016, I knew that would be cut. I also knew I needed to add both the fourth Strip Mine and the fourth Mishra’s Factory, so I moved the second Blood Moon to the sideboard. To accommodate this, I did a sideboard swap that would help my mana denial plan, by moving a Shatter to the main deck. Having so readily crushed weenie decks, I resolved to cut the two Earthquakes. That left but one open slot in the main deck. I considered many cards, but taking a cue from the Europeans, and doubling down on my mana denial plan, I decided the final card should be Stone Rain. Since I knew this deck well, and knew what changes I wanted to make, I did very little testing or even playing of this deck during the year between the 2016 and 2017 Eternal Weekend events. This is not a deck I play in environments where Strip Mine is restricted, so I ended up playing exactly 1 testing session in the entire year, and it performed very smoothly, as I expected. So I had high expectations. With 118 players in attendance, the Swiss+1 format meant that this would be an 8 round event, so I girded myself for a long day, even though the fun factor would be at an absolute maximum. Jack was a nice guy, and admitted that this was his first Old School event. He won the roll, and elected to play first. My opening hand was: Island, Time Walk, Ancestral Recall, Counterspell, Serendib Efreet, Serendib Djinn, Chain Lightning. If I can draw more lands off of the Ancestral, this hand is incredible. If I don’t, I’m dead. He opens with Tundra and Tundra Wolves. On my first turn I cast Ancestral, but draw Strip Mine and Sol Ring as my only mana. Good enough with me. On my second turn, I cast Sol Ring off of the Strip Mine, and Time Walk. I then cast Serendib Efreet, and Strip his Tundra. The race is on. He Disenchants my Sol Ring, and then plays a White Knight while I beat down. The Efreet raced his Wolf and Knight until I found a red mana, and started picking off his creatures until I won. In Game 2, he had to mulligan two no-land hands to 5. On the other hand, I drew excess mana this game. My opening hand was roughly Island, Island, Mox Sapphire, Counterspell, Strip Mine, Efreet, and no red cards or red mana. He Plowed my first Efreet, and I countered a creature of his. A second Efreet stuck, but it was a race. My life fell quickly, and I when I got him to 5, I decided to take a risk and fire off Timetwister, hoping to draw some burn, and I did. I drew a red mana, Lightning Bolt, and Chain Lightning, and immediately played both to win the game. I wished him luck and a great day, and went on my way. Ever had a Library of Alexandria spoiled by Black Vise? That’s what happened in Game 1. I dropped a Turn 1 Library on the play, and Evan dropped a Black Vise. Doing my best, I played another land, and cast Time Walk, so that by the upkeep of my Time Walk turn, I was already at 17. I then played a third land, and cast Chaos Orb, which I eventually used on his Vise. That’s when this match took a U turn. I Strip Mined Evan twice, taking him off of most of his color, but he resolved Sol Ring, Ivory Tower, and a pair of Candelabras. Things then got interesting when he cast Mana Flare. Since I had a hand full of countermagic and burn, and nearly had Library active again, so I let it resolve. I played an Efreet, and he tried to answer it with a Fireball. I Mana Drained the Fireball to cast another Efreet. He cast Icy Manipulator, and then cast Demonic Tutor for Maze of Ith, but mana burned to 10 life. On his end step, I double Bolted him to 4. Then he had to Maze and Icy my Efreets, but the Mana Flare generate two colorless, and he lacked a sink, since he tapped all of his Candelabras the previous turn to cast Icy, and thus had to mana burn again, going go 3. From here, I played a lethal Chain Lightning, and he scooped for Game 2. I believe I sideboarded in my Blue Elemental Blasts, Shatters, and Energy Flux. I probably sideboard out Blood Moon, the Red Elemental Blasts, Scepters, and Chain Lightnings. My Game 2 hand was unusual, but strangely potent: Library of Alexandria, Strip Mine, Strip Mine, City of Brass, Mox Ruby, Volcanic Island, and Island. Although this hand lacked spells, the combination of card advantage – unhindered by a Vise – and multiple Strip Mine, put Evan in a large hole, which was inescapable when I resolved Energy Flux, which wiped his board. Although it took a number of turns to actually finish him off, the victim was deceased well before the physician called it. Jimmy is an old teammate of the now defunct Team MeanDeck. He was a finalist in the 2008 Vintage Championship, and an SCG P9 finalist. He’s an exceptionally skilled player, and Top 8’ed the Old School Player’s Ball not long ago with nearly the same deck. Jimmy began our match with river of banter which he continued through our post-match conversation, including asking me what I was playing, noting the casual atmosphere, and our MeanDeck association. I told him I was playing the same deck I played every year at this event, but he seemed to infer that meant The Deck, for some odd reason. He admitted he was playing the same deck he played in The Player’s Ball. In the first game, Jimmy mulliganed to 6, but opened with Mox, Savannah, Sylvan Library. My opening hand would seem to be strong against that: Lightning Bolt, Chain Lightning, Psionic Blast, Red Elemental Blast, Recall, Mountain, and City of Brass, but it lacked threats, and was mana light. On his second turn, he ate 8 life to draw additional cards. On either Turn 2 or 3, he played Mishra’s Workshop, and cast a Triskelion as soon as he had mana for it. On Turn 2, I believe I Strip Mined one of his lands, and then, the turn after Trike resolved, I was able to kill it with Psionic Blast, but inflicted quite a bit of pain on myself in the process. On Turn 4 he played an Erhnam, and I double Bolted it. This pain had an upside, as it mitigated the two Mirror Universes he played in succession. I drew lands and another Red Elemental Blast, and eventually tapped out to cast Recall, discarding both Red Elemental Blasts, for the Psionic Blast and the Lightning Bolt. This worked well, because when I cast a Serendib Efreet and played a Mishra’s Factory, we were both at about 11 or so life, which meant that he could not profitably use the Mirror Universe. He also couldn’t use Sylvan too aggressively either, or my Bolts might kill him in a single wave. On the ultimate turn, I attacked him with a Factory and the Efreet, and a pair of Bolts finished him off. I struggled to sideboard a bit, because I had more threats to bring in than I had cards to take out. I wanted to bring in 3 Control Magic, 3 more Shatter, and all 4 Energy Flux. But what to cut? The first cards to come out were Red Elemental Blast and Disrupting Scepter. Blood Moon also seemed suboptimal here, and I didn’t want to refill his hand with Timetwister. I still needed to 4 more cuts. I think I cut Braingeyser as more of a late game card, and probably ended up only bringing in 2-3 of my Energy Flux, and perhaps only 2 of my 3 Control Magic. This time, he was a bit slower off the blocks, and opened with a Mishra’s Factory. On his second turn, he played Savannah and Sylvan Library, while I was already drawing cards with my Library. Unfortunately for him, his Sylvan failed to yield a Strip Mine. His retort was a turn 3 Erhnam Djinn. I contemplated sacrificing my Black Lotus to cast Counterspell, but felt I had a better plan with Control Magic. If Control Magic didn’t work, and he had a Disenchant, I reasoned that I’d have more time to find answers before dying to the Djinn. Most critically, although I didn’t know it at the time, the Strip Mine I used on his Savannah before casting Control Magic prevented him from casting Avoid Fate on my Control Magic, and I profitably stole the Djinn, using my Lotus. In the next few turns, he played a City in a Bottle, which I countered, a Juggernaut, which I burned, and a Disrupting Scepter, which I Shattered, all the while keeping my Library active. The Djinn killed him and won the match. Jimmy complained bitterly about Avoid Fate, and felt it was a “terrible Magic card I am never playing again.” After the match, Jimmy berated me for repeatedly misspelling his name in tournament reports (going back to the mid-aughts, mind you). Although I pleaded ignorance or error, Jimmy felt that the pattern was so long-standing that it had to be intentional. Therefore, in the spirit of those halcyon dates, I have playfully repeated the error here. My match against John last year was one of the most unexpected matches of the day. I actually managed to destroy all of John’s win conditions, and decked him in an epically long game. I usually do not win Game 1’s against The Deck, but also managed to stun him in a Game 1 in 2016, so that the epically long Game 2 won the match. Given that indelible scar I presumed to have left him last year, I knew this would be a tougher battle. The good news was that I was better prepared for The Deck this year. The bad news was that John just defeated 2015 Champ Randy Buehler in a mirror match, meaning that John was in top form. In this match, John barely said three words, but they were each references to iconic cards: “Book, the Stick, and the Stone,” which sounds like a great tween fantasy title, but refers to Jayemdae Tome, Disrupting Scepter, and Fellwar Stone. In the first game, I resolved a Turn 2 Disrupting Scepter, which I snuck into play when he tapped down to cast Fellwar Stone. Unfortunately, he responded with a Jayemdae Tome on his turn. For the next half dozen or so turns, I spent my mana trying to grind down his hand, while he used his – greater – resources, trying to offset the effect by drawing cards with the Tome. I managed to Shatter the Tome, but he replaced it, and kept at it. Eventually, he Disenchanted my Scepter (aka “The Stick”), and his Tome took over. I tried to pivot into an aggressive role, but it was too late. The Abyss started sucking up my Efreets, Strip Mine and Plows targeted my Factories, and I was quickly (in chronological time, not turns) dispatched by his Factories and a Fireball. Game 2 worked according to plan. I had double Strip Mine, and hit his first two lands, and Shattered his Sol Ring, leaving him manaless long enough for me to capitalize. I cast Disrupting Scepter and an Efreet. While the Scepter failed to do anything while he was landless, as soon as he started playing land, the Scepter slowly put pressure on him to decide whether to play spells or do nothing. He tried mightily, but my early game lead matured with victory. Game 3 was quite intriguing. My opening hand had Black Lotus, but only Disrupting Scepter. I really want a Turn 1 Blood Moon against The Deck (or even an Energy Flux), not a Scepter, since it requires 3 mana to activate. Stupidly, I decided to hold my Lotus to hope I might draw a Blood Moon, thinking that I’d soon have an opportunity to play Scepter. But John did what The Deck players everywhere want to do: just play lands, passively doing nothing. He didn’t open with Fellwar Stone or anything like that. Instead he just played a land, then another, then another, each of which produced blue or red mana. By Turn 3, it was too late to realistically hope to resolve and protect the Scepter, when I could have been productively using it. I did draw an Efreet on Turn 2, but held off playing that as well, for fear of wasting a Lotus and an Efreet on a Red Elemental Blast or Swords he might be holding. My failure to produce board permanents opened me up to another attack, and one of the best trumps The Deck has: Mind Twist. He cast it, with one red mana up, so that he could Red Blast any counterspell I might throw at it. Despite that devastating play I managed to climb back in to the game a little bit with some fortuitous top decks. But he Demonic Tutored for Fireball, and then killed me, short circuiting my slightly improving chances. Randy and I have played each other in each of the past 3 EC Old School events, and in our VSL pre-game commentary I expressed my anticipation of our inevitable rematch, and predicted that it would be “decisive,” in reference to who would Top 8 – or win – this event. As you can see from my 2015 report, Randy was the only player to defeat me in that event, in the Top 8. Had that event been a Swiss+1 structure, I likely would have won that tournament, and not Randy. As described in my 2016 report, I ended up winning the match on Chaos Orb flips, after splitting a bruising pair games, but we were unable to complete an intense and immersive third game on account of time. This match was our third in the series, and would be the tie-breaker. I was looking forward to it as much as I claimed, and felt my chances were good, despite the loss I just suffered at the hands of John Grudzina. I felt confident that the adjustments I had made year over year improved my matchup. Randy won the roll, and opened with Library of Alexandria in Game 1. Unfortunately for him, I had a pair of Strip Mines, which claimed the Library and a Tundra, but that just slowed, not stunted, him. I played some creatures, which attacked a few times until he drew removal, but a bit of pressure combined with burn took a toll on his life total. He resolved a Jayemdae Tome, but my main deck Shatter destroyed it in response to one of the end step activations. This allowed my Braingeyser for 5 to get me back in the game that I had slowly been losing control of, and Randy noted how swingy this game had been – a sign of a great game His Strip Mines, unfortunately, took out all of my red mana (I had drawn almost all of my basic Islands), and I was cut off from burn. I therefore played a Serendib Djinn with at least 6 Islands in play, to try to finish him off, since he was only at 5 life. Unfortunately he played The Abyss, and then swiftly overtook me. I sideboarded the same as I had in the Grudzina match above. Game 2 went according to plan. I resolved a Disrupting Scepter early and started using it. Once I had ground him down a bit, I landed Energy Flux, which wiped out three permanents from his board, undoing much of the investment he had already made. I kept the Disrupting Scepter in play, and kept him low on cards while I built up to Library of Alexandria range. He topdecked an Ancestral, if I recall correctly, to temporarily get back into the game, and Stripped the Library, but my long-built advantage held, and I won with Serendib beats. While we were sideboarding, Randy verbalized some difficulty he was have sideboarding, by noting that my deck has so many unique angles of attack: creatures, countermagic, enchantments, and artifacts, and that most of his cards can only address any two of them, but not all of them. I hadn’t recognized that, but having many unique answers and threats was, broadly, part of the reason I employed this strategy. Blood Moon and Energy Flux, in particular, are the strategic strengths of straight Blue-Red aggro control, while the Red and Blue Elemental Blasts are the tactical strengths. Randy led with a dual land, and passed. I played the Ruby, then the Lotus, then Volcanic Island. Clearly, the card I want to resolve is Blood Moon, so I decided to lead with Ancestral Recall, to see if I might draw out a counter. I tapped Volcanic Island, and cast Ancestral, and to my surprise, Randy responded with his own Ancestral. Naturally I Red Elemental Blasted it. Some spectators wondered why Randy hadn’t cast Ancestral on his own turn, and he explained he did not want to have to discard down to hand size, having no Moxen in hand. He further explained that he planned to cast it on or about Turn 3. My explosive hand forced him to change of plans. I sacrificed the Lotus for red and cast Blood Moon. It’s clear that Randy’s deck is much more vulnerable to Blood Moon over the years. In 2015 he had four basic lands in his 75, whereas this year he only had 2. In 2015, when he last beat me, he had 4 Blue Elemental Blasts, whereas now he only had 2. I’m not questioning the validity of those choices; I’m simply pointing out that they make his deck a bit weaker to the Blood Moon strategy. The rest of the game was perfunctory. I drew my basics and capitalized while he was locked under Blood Moon. He played a Jayemdae Tome, which I Shattered, but everything was dénouement after Turn 1. For the second time today, Black Vise spoiled my first turn Library of Alexandria (on the draw no less). His second turn Ankh of Mishra was as good as game over, and I was quickly locked out. He burned my Factory, and an Atog finished me off. I was astonished how fast this game was. I brought in Blue Elemental Blasts and Shatters for Blood Moon and Disrupting Scepters, among other cards. Game 2 was the classic Strip Mine into oblivion game. I Stripped his colored lands, leaving him with a few Strips for me, but I quickly capitalized. Game 3 was a pure sprint. I had Black Lotus and Serendib Efreet on the first turn, and I just raced him. He resolved two Ankhs, Volcanic Island, Mox Ruby, and a Sol Ring. I ended the game with Maze of Ith and Volcanic Island in play, at 6 life on the final turn I attacked him with the Efreet, but he only had 1 Bolt at the end of the game, leaving me at 3, and winning the game on my next turn. I probably did not need to play the Maze, but I did so between Ankhs, and feared not being able to play another land if he should play a second Ankh. I felt like I escaped from that match by the skin of my teeth. Having lingered at the top tables long enough, I knew what Scott was playing. I felt pretty good about it, having done well against Disco Troll last year. In the first game Bradley was forced to mulligan to 5, but recovered a bit with Ancestral in his opening hand. He then made a game of it. I landed a turn 2 Serendib, and Stripped a black source after he resolved a Sedge Troll, so that a Bolt could kill it. The Serendib raced him and won. I sideboarded in all my blasts and all my Shatters, which was probably too many. It’s hard to tell how effective Blood Moon is in this matchup, but it seemed good. In Game 2 he mulliganed to 6, but once again found Ancestral Recall. This game was too difficult to manage, and he drew an absurd abundance of countermagic. The decisive play was his Mind Twist after I had tapped down, which just about wiped me out. I hung on for a while, but it didn’t really matter. He killed me with a Sol’kanar the Swamp King, just for good measure. I decided I had too many Shatters, and subbed one back out for other utility spells. Game 3 was entirely, and unfortunately, decided by Strip Mine. My opening hand had a Volcanic Island and two Strip Mine. Unfortunately, he also had a Strip Mine. We Stripped each others’ colored mana sources, but I couldn’t draw another colored mana source for 7 or 8 turns, even being forced to discard a half dozen spells. Just before I drew a colored land, he Mind Twisted my hand away, and that was that. In the first game I opened with Mox Sapphire and an Island, and a Turn 2 Sol Ring, and a Turn 3 Serendib Efreet. He played a second turn Hymn to Tourach, which I countered with Counterspell. He tried to Terror my Efreet, and I countered that as well. He threw a Lightning Bolt at the Efreet, which I let resolve, and he forgot that the Efreet survived. Whoops. I won this game shortly thereafter. In the second game, Jonathan was pretty impressed with my opening hand of Mox Sapphire, Mox Ruby, Chaos Orb, and Black Lotus, but what he didn’t appreciate was that my entire hand was mana, countermagic, and burn. I drew a Factory, and he tried to play a Serendib Efreet, but I Red Blasted it. He played another. I had a Chaos Orb in play, but my success rate is less than 100%. So I decided another answer: to attack with Factory, and he blocked, so I Bolted the Efreet, trading 2-for-1. I then drew down Disrupting Scepter, which I immediately used (sacrificing my Lotus). He discarded Terror and a Serendib Efreet in successive turns. He topdecked Ancestral Recall, however, and was able to use that advantage to Recall both Serendibs to his hand, with hopes of playing both next turn. I Strip Mined one of his lands, so he could only play 1, and I forced him to discard the other. Once he was soft-locked with Scepter, I resolved my own Ancestral, which spawned a Serendib Efreet and a Serendib Djinn, my ultimate finisher. I didn’t care about his Efreet, since my Djinn would quickly overwhelm it. Remarkably, he topdecked a Sengir Vampire, which he played. I attacked with the Serendib Djinn (after sacrificing a City of Brass). He double blocked with the Vampire and the Efreet. I put 4 damage on the Vampire, and 1 on the Efreet, and the Bolted the Efreet to kill it. The next turn I attacked with a Factory and an Efreet, and then killed him the following turn with the same attack. This finish was good enough for my third straight Top 8 at this event. To my knowledge, no one else has Top 8’ed it consecutive years, let alone three times in a row. As I said, the event was a blast, and the vibe in the room was amazing. The deck felt perfect. If I was playing in Eternal Central’s Old School event in 2018, I doubt I’d change a thing, although most of the changes I make in intervening years only surface to mind a few months after the event. I could see the case for a third Blood Moon somewhere, but it’s really only a tactic you want against The Deck or other 3c or 4c Control decks. The second Scepter worked like a charm, and the third Control Magic felt reassuring. I certainly don’t think this deck needs that Earthquake anywhere. Unfortunately, the continual coincidence of the Vintage Championship prelim tournaments for byes with this event has negatively impacted my ability to do well in the Vintage Championship. Until and unless this is scheduled on a different day than the only day I can earn byes (since there are almost no opportunities to play for byes in California), sadly, I will likely have to skip this event next year. Although this is just about as much fun as you can have playing Magic, winning another Vintage Championship is more important to me, and I don’t feel like I have much to prove in Old School anyway, having carved out an Old School resume I’m proud of in just a few short years. I would be lying if the unrestricted Strip Mine environment was not also somewhat dissuasive. As much as I enjoy playing UR Control, I would prefer not to play it 4 years in a row. I really want to play Combo and/or a Tabernacle Winter Orb deck, such as those I wrote about recently. But as I said before, these strategies are considerably weaker in the unrestricted Strip Mine environment. It also baffles me that Eternal Central continues to restrict Maze of Ith when the Europeans have demonstrated how safe it is to do so, and doubly so when EC has 4 Strip Mine to keep it in check at the same time. In my opinion, the EC format is overly tilted towards Aggro and Tempo decks, at the expense of other strategies. The resulting Top 8 from this event bears this out, as all 8 of the Top 8 decks had 3 or 4 Strip Mine, or another 30 Strip Mine Top 8. 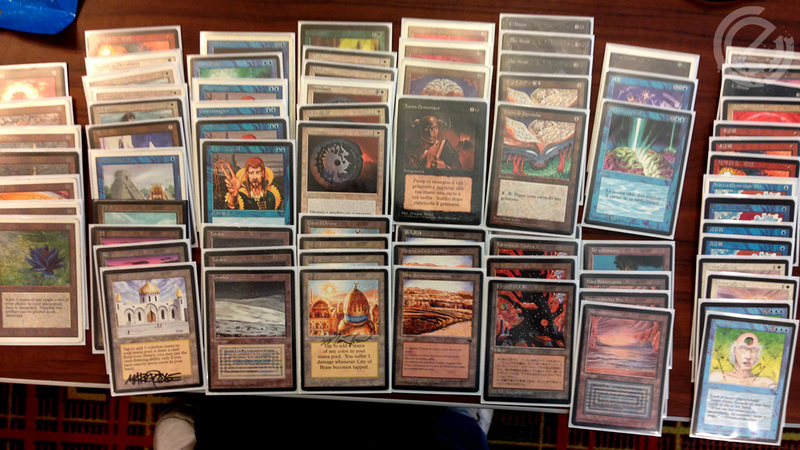 Most of the decks were White Weenie, W/U/x or Blue/X Aggro Control decks. That is precisely what I would expect in such an environment. If Strip Mine were restricted or Ice Age were permitted, combo and prison strategies would have much more capacity to develop and compete instead of being run over or succumb to variance. On the other hand, my experience in Eternal Central environments has persuaded me that Mishra’s Workshop can be safely unrestricted without much problem. Every time I’ve faced it, I’ve easily handled it with Energy Flux and/or Shatters. I feared for a long time that Workshop plus Juggernaut/Su-Chi followed by Winter Orb and/or Icy Manipulator was simply too fast and disruptive, but I think there are enough tools in the environment to handle the Workshop Aggro deck. In fact, the best thing the Workshop deck can do is Strip Mine you after resolving a Juggernaut or a Su-Chi. So in environments with Strip Mine restricted, I don’t even think it’s a debate. If Strip Mine were restricted, then Recall and possibly even Regrowth could be safely unrestricted in 93/94. Even with Strip Mine unrestricted, I’m skeptical that Recall needs to be restricted. If I ran the EC rules, I would probably unrestrict Recall. Recall is not the kind of card that even recursive decks would run more than 2 or 3 of. It’s not a “4 of” kind of card. Although Regrowth certainly could be. Unlike Regrowth, Recall cannot be iterated indefinitely, since it removes itself from game. And the costs and mana expensive of using Recall are broadly fair. It’s a good card, but it’s hardly fast or speedy. And, if combo recursion decks became too powerful, the format supplies the answer with Tormod’s Crypt. 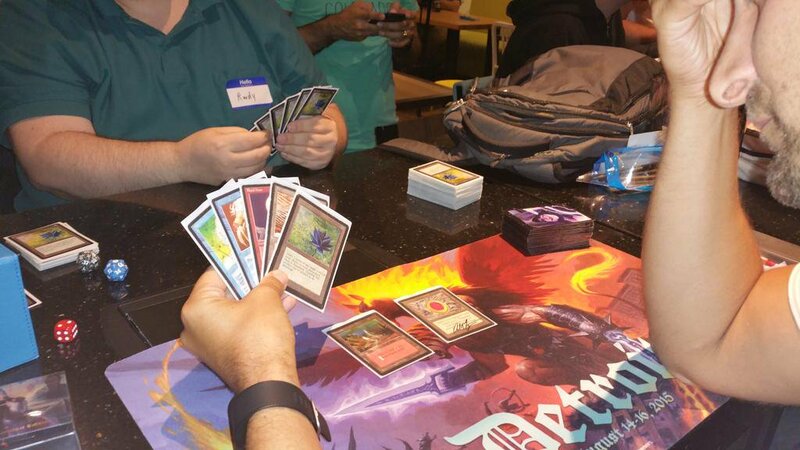 At the end of the day, I saw some amazing decks, old friends, and made new ones. What’s not to love? Old School brings the best of what Magic offers while allowing players like myself to relive the strategies that brought us to the game in the first place.